A newly released study from the U.S. Center for Disease Control reveals that contact sports are the top cause of emergency hospital visits for kids, who are particularly vulnerable to the long term effects of head trauma because their brains are still developing. Unsurprisingly, the most popular sports among young athletes are also those most closely linked to childhood head trauma—basketball, cycling and football for boys; soccer for girls. While safety measures for each sport require reappraisal, youth football must be specially scrutinized, due to its emphasis on hard physical contact. Anyone who has followed football at any level—peewee, collegiate, professional—over the last several years is likely familiar with at least some of the controversy surrounding the sport’s link to chronic traumatic encephalopathy (CTE). Since 2011, there has been a deluge of high profile studies, exposes, and lawsuits related to the subject, bringing public awareness of the issue to an all-time high. While the NCAA and NFL continue to deal with the fallout of this new paradigm, youth football has undergone a similar reckoning, one that is arguably more intense because of its focus on children and its reach into the public sphere. A 2018 study from Boston University School of Medicine found that children who play youth tackle football before the age of 12 were at higher risk for early brain damage, which often results in the development of emotional and cognitive problems, including attention and memory deficits, impulse control issues and depression. Much of the fallout from this new awareness has played out in the legislative arena, as cities and states attempt to figure out how best to handle the issue. Five states, including California, Maryland, Illinois, New York and New Jersey have attempted to outright ban youth tackle football prior to high school (with 12 being the cut-off age in most cases). Predictably, these proposed laws have become lightning rods for controversy and faced stiff opposition from coalitions of parents, coaches, and other supporters of traditional youth tackle football. That opposition has proven insurmountable thus far, as none of the five bills came anywhere close to passing. Legislators in Boston are currently trying to pass their No Hits bill, which would ban organized youth tackle football in grades 7 and lower and impose fines on schools and leagues that don’t comply. No Hits faces the same grassroots opposition as the other bills, and at this point seems similarly doomed to defeat. Despite this record of legislative failure, reforms are ongoing. The New Jersey State Interscholastic Athletic Association (NJSIAA) recently adopted new guidelines limiting full-contact (defined as contact that results in one or more players bringing another to the ground) in high school football practices to 15 min per session. It’s the seventh state to set such limits and is the most extreme so far. The similar guidelines set in other states still allow for 60 minutes per practice session. 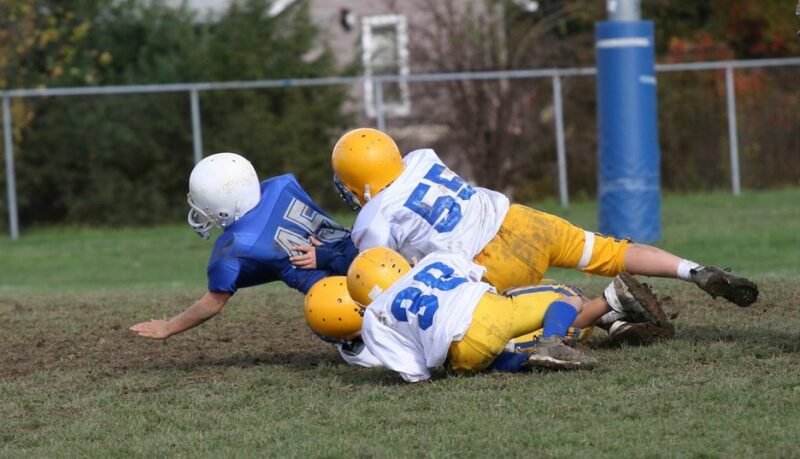 The adoption of safer tackling methods and new play rules have been the response of choice for youth football leagues, including USA Football and Pop Warner. Pop Warner, the largest and longest-running youth football league in the country, who settled a multi-million dollar lawsuit over concussions only three years ago, recently announced changes that include bans (ranging on division age) on three-point stances and certain kickoffs. Regardless of how the issue continues to fare in the political theater or the courtroom, youth football may still have difficulty sustaining itself in the coming years. The great irony is that, for all the energy supporters of traditional youth tackle football have put into combating government efforts to ban or further regulate the sport, it may be the private market and court of public opinion that ultimately does away with it. Parks departments are pulling away from sponsorship of youth tackle football, while enrollment is down across all levels of play, including high school. Parents are less willing than ever to let their own kids take up the sport, despite their steady commitment to watching it. Polls taken last year revealed that almost half of parents would discourage their children from football, out of fear of concussions. The biggest threat to the sport’s future is economic, as insurance providers refuse to carry leagues and programs, including the NFL. Prior to 2011, “at least a dozen carriers occupied the insurance market for pro football.” Today, there is only one. While the NFL is wealthy enough that it could probably self-insure, youth football leagues don’t have the same luxury. According to Pop Warner Executive Director Jon Butler, “People say football will never go away, but if we can’t get insurance, it will. The more we learn about the effects of youth tackle football, the less sustainable it seems. But any concern over what this means for the popular pastime in-and-of itself is less important than what it will mean for the kids who play it. One silver lining to all this controversy is that there are now a number of changes and reforms being made, including stricter safety measures and guidelines, investment in better helmet technology, a greater awareness of the danger of concussions, and an open line of dialogue dealing with the hard questions about youth tackle football that even a decade ago weren’t on many people’s radar.